The Fleet VisorWallet™ is a handy storage device for your fuel card located conveniently on vehicle's visor. The Fleet VisorWallet™ features a heavy duty 30-gauge clear vinyl card holder that opens short side and uses a 1" wide elastic strap that keeps it securely attached to the outside or inside of your vehicle's visor. It attaches securely around the visor and keeps the fuel gas card with the vehicle so it never gets lost and is never out of reach. Use the generously sized pocket to hold and store receipts related to expenses for each vehicle in the fleet. The heavy-duty wide elastic strap band is universal and sized to fit almost any vehicle's visor, adjustable up to 17". Heavy-duty clear vinyl storage pocket large enough to accommodate 3 - 4 credit card sized CR80 plastic cards. Stitched leather loops connecting the fuel card holder pocket to the adjustable mounting strap for long-term use. 1" wide 17" long adjustable elastic strap that keeps it securely attached to the outside or inside of your vehicle's sun visor. 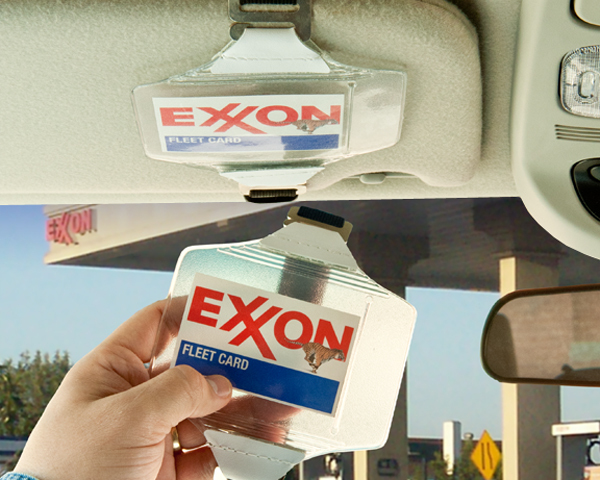 A visor organizer to hold your fleet gas card or fuel card and related receipts is convenient and secure. Use it to for your entire fleet to store fleet gas fuel cards in each vehicle neatly and always have them where they should be when they are needed. Get one for your car and keep your drive-thru gift card, loyalty card, debit card or anything else that you want to keep in arms reach. Mount inside or outside your visor easily. With the clear vinyl fuel card holder keep a photo ID, insurance card, fuel card, business cards and small papers handy and secure. Its size is large enough to accommodate 3 - 4 credit card sized CR80 plastic cards. Made to last with heavy-gauge vinyl and a sewn-on adjustable elastic strap, the Fleet VisorWallet™ exclusively from RNR Plastics is ideally suited for daily car rental companies, airports, utility fleets, municipal car pools, law enforcement, taxis, limousines, trucking companies, construction vehicles, and many other applications. Contact us for information about custom printing on your visor gas fuel card holder such as brand information, driver instructions or fleet service information. Sold with black elastic straps. Orders over 100 pieces may specify other colors of straps choosing from white, blue, green, red or yellow. Please note that gas, gas receipts, fuel cards, visor, and the vehicle are not included.